[세계-사회 이모 저모] > 멕시코, 진도 8.2 지진 발생 동안 하늘에 괴이한 광채 계속 번쩍...정체는? [시사뷰타임즈] 멕시코의 진도 8.2 지진은 ‘수도 하늘에 지진 광(빛)’이라고 알려진 보기 드문 현상을 야기시켰다. 이 빛은 초록색과 흰색이 섞인 빛깔의 섬광이 멕시코 시티 상공에 번득이는 것을 볼 수 있었다. 현장에서 찍어 올린 영상은 극적인 모습을 보여준다. 이러한 현상에 대해 알려진 것은 거의 없는데, 때론 발전기 또는 동력장치가 폭발하는 것이라고 설명되기도 한다. 또다른 설은 석영을 포함된 바위들이 지질학적으로 움직이면서 섬광을 발하는 압전기(壓電氣)장을 생성시킨다는 주장이다. 2014년 한 연구에선 지질판이 압박되면, 지질판들을 지구 표면을 향해 밀어붙이면서 공기와 혼합될 때 빛을 발산하는 플라즈마(주: 자유로이 운동하는 음양의 하전 입자가 중성 기체와 섞여 전체적으로 전기적 중성인 상태. 별들 내부, 별들 사이의 공간에 있는 물질의 상태)가 형성되면서 음전하를 띄고 한 쌍으로 돼있는 산소 원자들을 분리시킬 수 있다고 말했다. 100년 만에 가장 강력한 금요일 지진에 따라 대 해일 경고가 있었다. 최소 5명이 죽은 것으로 보도됐는데, 사망자 수는 더 늘어날 것으로 예상된다. 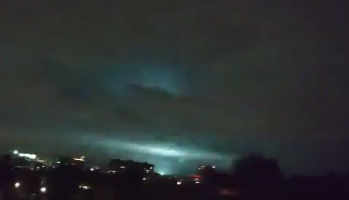 Friday’s 8.2-magnitude quake in Mexico caused a rare phenomenon known as earthquake lights in skies above the capital city. The lights could be seen flashing above Mexico City in hues of greens and white. Video uploaded from the scene shows the dramatic display. Little is known about the phenomenon, which can sometimes be explained by exploding generators or power systems. Another explanation claims that the tectonic movement of rocks including quartz, generates a piezoelectric field which produces flashes of light. A 2014 study said the stress of the tectonic plates can break apart pairs of negatively-charged oxygen atoms, pushing them towards the Earth’s surface and forming a light-emitting plasma when it combines with air. A tsunami warning is in place following Friday’s earthquake, the strongest in a century. At least five people are reported dead with the number expected to rise.